I have found Mastermind groups to be an amazing format to build executive excellence. In case you haven’t attended a Mastermind group, I’ll tell you how and why they work so well. It starts with the group leader or chair hand selecting executives who have the right mindset and motivation to work collaboratively. The leader is generally an executive mentor of some sort, and the best leader is someone who has years of experience working with executives both individually and collectively. After the leader selects 8 to 16 executives from various industries, the group begins to meet – either once a month for between 4 and 8 hours, or twice a month for 2 to 4 hours. The idea is to have each executive delve into some of their goals and challenges as they grow their organization. The members listen, and then assist in the problem-solving by sharing their own experience, providing referrals to other experts, and supporting each other as the discussion unfolds. I should also mention that the group is in a confidential, closed-door atmosphere where honesty and integrity are the foundation of candid, open discussion. What happens in mastermind group, stays in mastermind group. As you can imagine, given the parameters I’ve outlined, over time this group of executives learns to rely quite heavily on one another and I’ve witnessed amazing insights and breakthroughs occur in such groups. The members build respectful, trusting relationships that they otherwise would not have found within a truly collegial environment. Not only are they building their own businesses, they are giving each other lessons from their experience to selflessly guide, advise, and support. It is incredibly powerful to have a group of peers holding each other accountable for both their participation, and for making progress towards their goals week in and week out. I cannot tell you how many times I’ve heard that the highlight of each member’s week or month is getting together with their group and tackling a new goal. I sat with a group of CEOs who were all commenting on the state of their respective organizations. Interestingly, each of them discussed how their company was “in transition” as it applies to reorienting within the scope of the marketplace. The upshot of which was that each company was looking at their leadership and employment structure in an effort to maximize efficiency while streamlining for performance. As a result, some of their leadership was going to transition up into stronger roles within the organization, some were going to need to transition laterally within the company, and some were going to need to transition out of the company altogether. A few of the CEOs took this period in stride; They’d seen their company go through this process of organizational transition during former times of growth and change. Others were (to be honest) scared – and rightly so. How this period of transition takes place can either thrust the company ahead with increased organizational enthusiasm, or send it into a downward spiral leading to months of re-stabilization and recovery. So what was going to make all the difference in the world? If you’re familiar with our conceptualization of these processes, then you know that my response is going to be: Emotional Intelligence. An executive’s approach, the executive team’s approach, and staff approach to transition will likely determine how effectively transition can be implemented. It will determine how many staff members step up to the challenges ahead, and how many bail out. It will determine how efficiently transition can be implemented across the organization, and how resilient teams within the organization can be in rolling with necessary changes. And the outcome can be measured by what gets saved, what gets left behind, and what get’s lost – financially or otherwise. When done right (with strong emotionally intelligent thoughts and behavior), the benefits of transition will strongly outweigh the costs. When done poorly (without emotionally intelligent thinking and behavior), the costs can be so damaging that it will take months or years to regain stability within the organization. This prompted a wonderful discussion among the executives at the table. I’m fairly confident that if these 7 or 8 CEOs were feeling the process of transition occurring in their organizations, then there are many more dealing with similar circumstances. Nicely, none of this needs to happen in a vacuum. 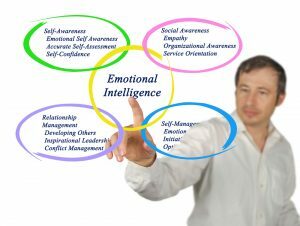 The skills for emotional intelligence can be learned, enhanced, maximized, and optimized so that any transition can be managed to increase the benefits and minimize costs to the organization. Believe me, those CEOs who displayed emotionally intelligent thoughts around the processes were much more confident in the outcome than were those to whom emotional intelligence was a new conceptual framework. We are here when you’re ready to move ahead confidently.